Organizing your recipes all in one place is a great idea, but the thought process usually ends just as a thought. Putting all of your recipes in recipe organizers is difficult because you still have to organize all of the recipes and most of our recipes are either cutout of a magazine or written on paper that is all different sizes. In addition, if you are looking for a particular recipe, you still have to go through the binder to find it. In the long run, your life will be much simpler if you create a database in Access to hold your recipes. 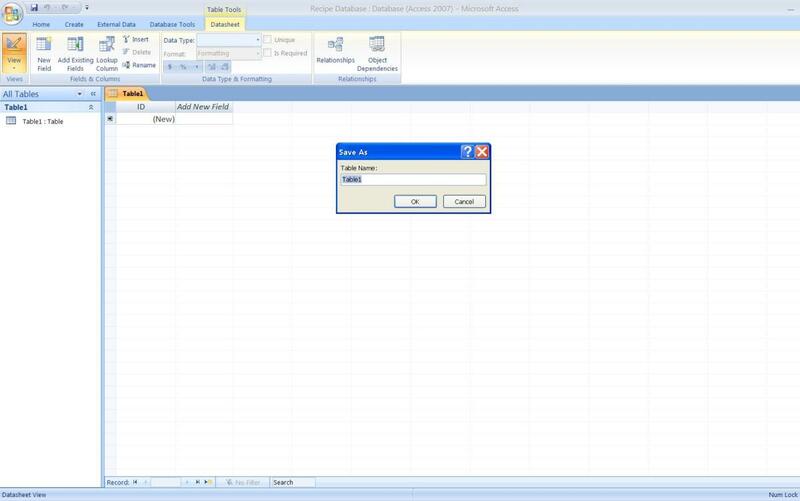 Open Microsoft Access and click on “New Blank Database” at the top of the screen. On the right hand side, a box will come up and ask you to give it a filename and select where you want to save the file. 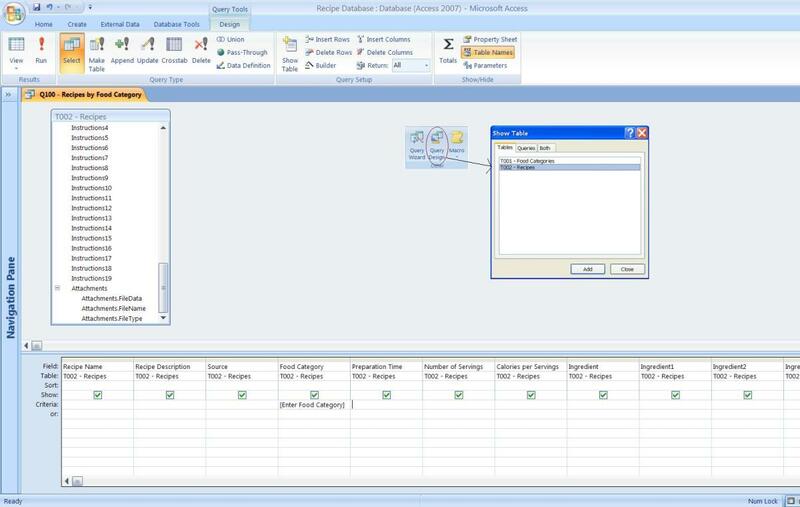 Click on the “Create” button and now you are ready to start building your database. The screen should be blank with a “Table1” in orange at the top with only “ID” as a category. 1. Click on the View icon in the upper left hand corner of the screen and select “Design View” which will cause a “Saves As” box to pop up. 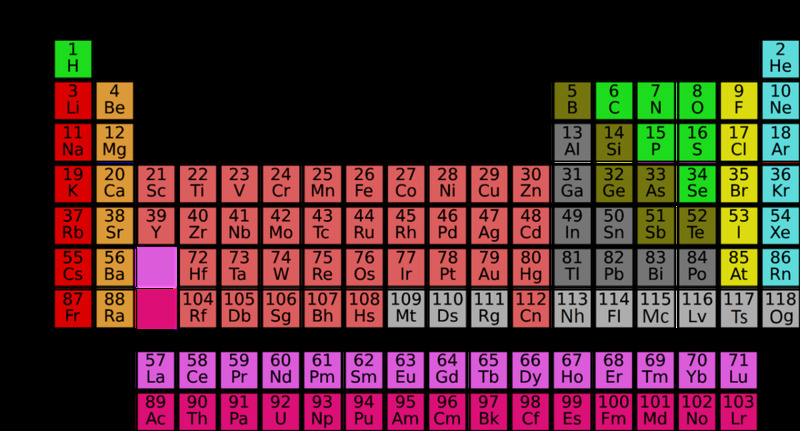 Save this table as “T001 - Food Categories”. Save and close the table when finished. 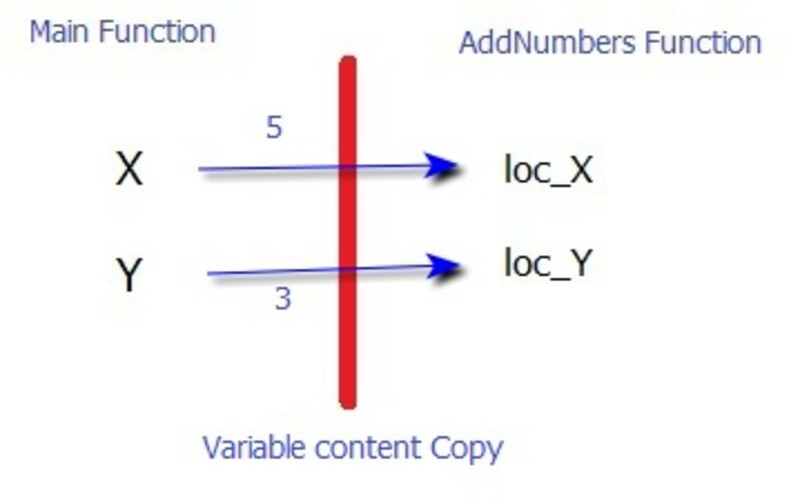 Number of Servings – Number, set the decimal places at the bottom to 1 decimal. Calories per Serving – Number, set the decimal places at the bottom to 0 decimals. Attachments – Attachment Format – This allows you to attach pictures or a copy of the actual recipe. Note: It is important that you add all of the fields that you think you may want now. It is easier to either skip fields or ignore them than it is to add fields later because you have to add them to any queries, forms, or reports that you plan to use. Now we will create a form for the two tables. The Food Categories Form will be quick and very simple to do. The Recipes Form will be the fun one that will take some time to layout, but it will not be too difficult. Click on Access’ “Create” tab and then click on the “More Forms” drop down in the Forms section. Select “Form Wizard” and an input box will pop up. Click on the Tables/Queries drop down and select “T001 – Food Categories”. Click the right arrow to select “Food Category” as a selected field. Pick a style that you like. I prefer the “Windows Vista” myself. Click next again and name the form “F001 – Food Categories.” Change the bottom selection to “Modify the form’s design” and click Finish. Under the “Detail” area of the form, pull the box around “Food Category” over until it is lined up with the 3” mark. Pull up the light blue bar (Form Footer) until it touches the bottom of the “Food Category” detail box. Click on the “View” button and this will show you what you form looks like. You should see everything that you typed in when you built the table. Close and save the form when finished. Click on Access’ “Create” tab and then click on the “More Forms” drop down in the Forms section. 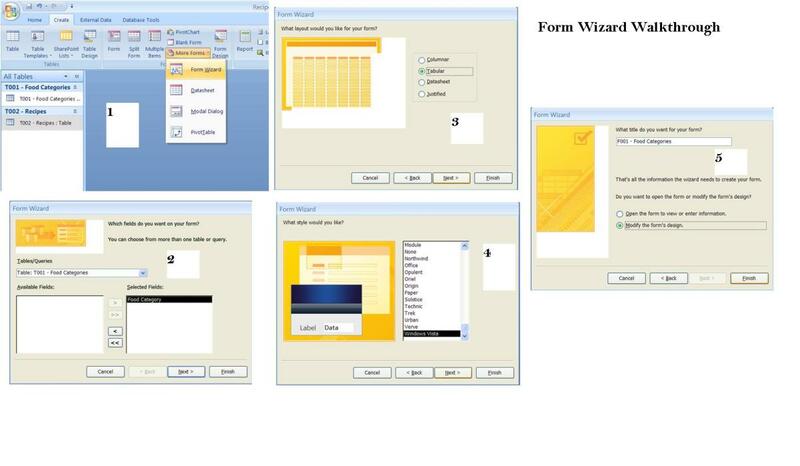 Select “Form Wizard” and an input box will pop up. Click on the drop down box and select “T002 – Recipes.” Now click on the “>>” and all of the fields in our recipes table will be included on our form. Click next twice since the columnar form works the best for what we want. Select your favorite style and click next. Change the title to “F002 – Recipes”, change the bottom selection to “Modify the form’s design”, and then click Finish. A messy and disorganized form will pop up. On the far left side of the toolbar on Access’ “Design” tab, click on the drop down and select “Design View.” The best way to clean this up is to click near the top left of the detail box, hold shift down, and highlight all the way to the bottom right hand corner and hit the delete key. You can leave the form title above the line. If it is not already open, click on the “Add Existing Fields” button on the “Design” tab. Click “Recipe Name”, hold down the shift key, and click on the last field. 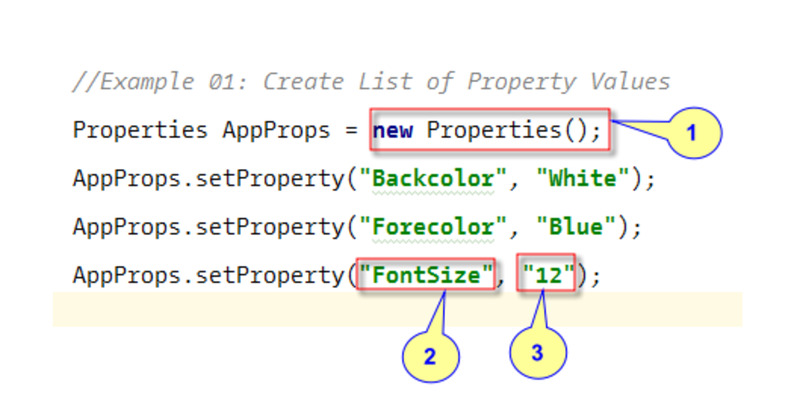 Drag the highlighted section and put it a little ways down from the “Detail” bar. Layout the form however you want. I have attached a screenshot of how I laid my form out. For the top 7 fields, click on the title to drag them to where you want them. If you wish to put more or less space between the title and the field, click and drag the little brown box to the left of the field. Tip #1: One tip that I would offer is to click above the title for “Ingredients”, highlight all of the titles to the bottom, and delete the titles before reorganizing your fields. Tip #3: Be patient. It will take a while to align everything the way you want it. To insert new titles, click on the “Label” button on the “Design” tab and draw a box on your form. Type the label and hit enter. Format the box so that it stands out as a label. Scroll all the way to the far right as you can and pull the right edge over to around the 13-inch mark on the ruler. Depending on your display settings, you may need to play with this a little. Do the same thing for the bottom. Toggle back and for between “Design View” and “Form View.” My goal is not to have either of the scroll bars being visible. Change the form title to whatever you want to call it. In a blank area of the form, right-click, which will bring up a menu, select “Tab Order. . .” This menu controls how the tab key works in your form as you move from field to field. I made my form start with recipe name and then have it going to recipe description. Then it moves across the rest of the fields at the top in the same way (top, bottom, top, bottom, etc.) Then I have it go from quantity to ingredient, quantity1 to ingredient1 and so on. Finally, I have it go straight down the instruction fields. Enter at least two different recipes into the “Recipe” form, preferably into two different food categories. This will make it easier to create queries and reports. On Access’ “Create” menu, click on “Macro”, and the macro screen will pop up. Under the action column, select “Open Form”. 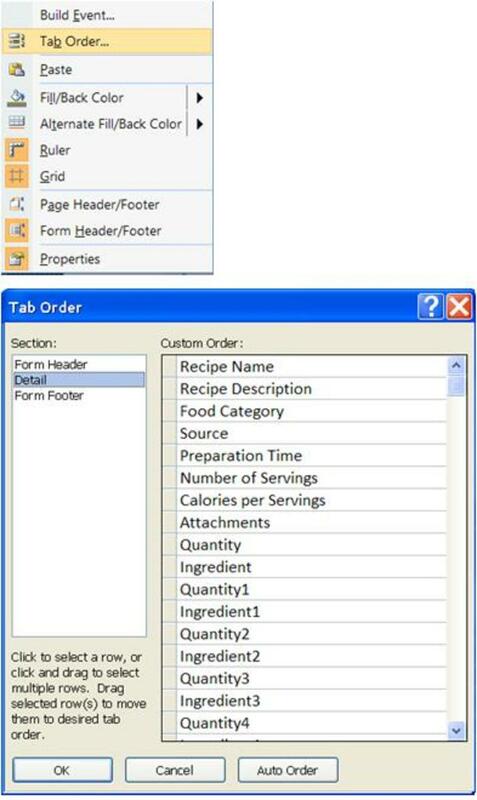 On the bottom section, select “F002 – Recipes” as the form name to open. Back up under the action column, select maximize. Next, select “GotoRecord” as your action. In the bottom section, choose form as the object type, choose “F002 – Recipes” as the object name, and select “new” from the record drop down. Save the macro as “autoexec”. This tells Access to open this form when the database is opened. Go to Access’ “Create” tab and click on the “Query Design” button. 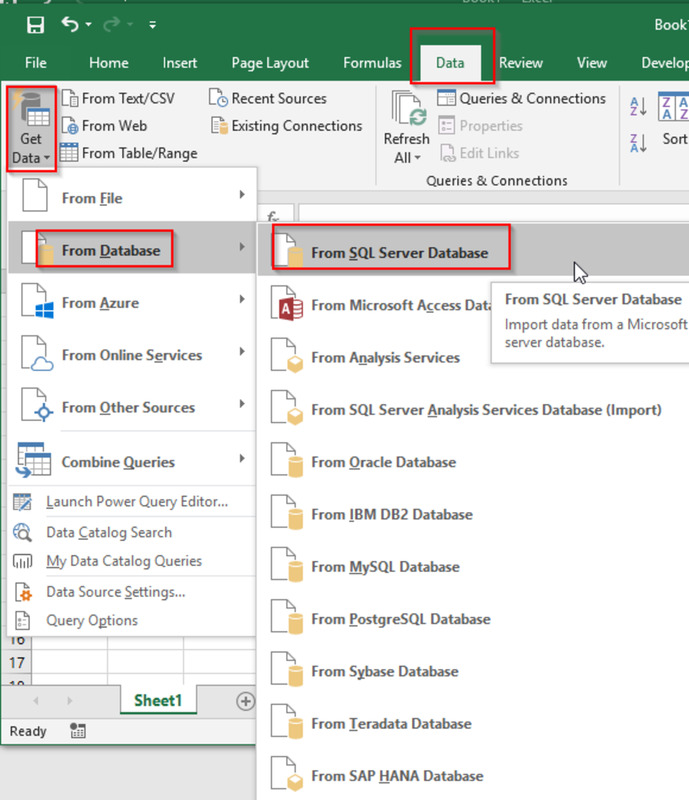 A pop up box will appear asking which table to base the query on. Click on “T002 – Recipes” and click the add button. Now click close. Click on “Recipe Name” in the “T002 – Recipes” box, hold the shift key down, and then click on the bottom field name. It may take a second or two to respond. Once it is highlighted, drag all of the fields into the boxes below. Under “Food Category”, go down to the criteria row and enter the “[Enter Food Category]” without the quotation marks. This will cause a pop up box to come up when the query is run that asks you to enter the food category that you want. We will use this to generate a report. On the left hand side of the screen, right-click on “Q100 – Recipes by Food Category” and select “Copy”. Right-click again and select paste. This will bring up a pop up box asking you what to paste the name of the query as. Enter “Q101 – Select Specific Recipe”. 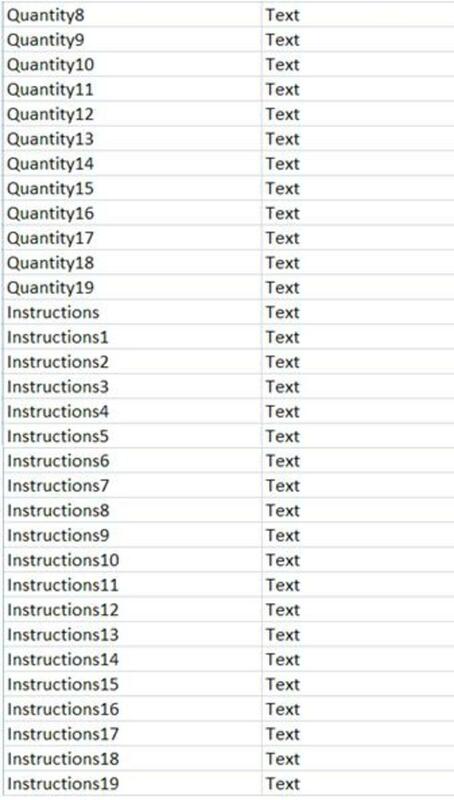 Save the query and exit out of it. 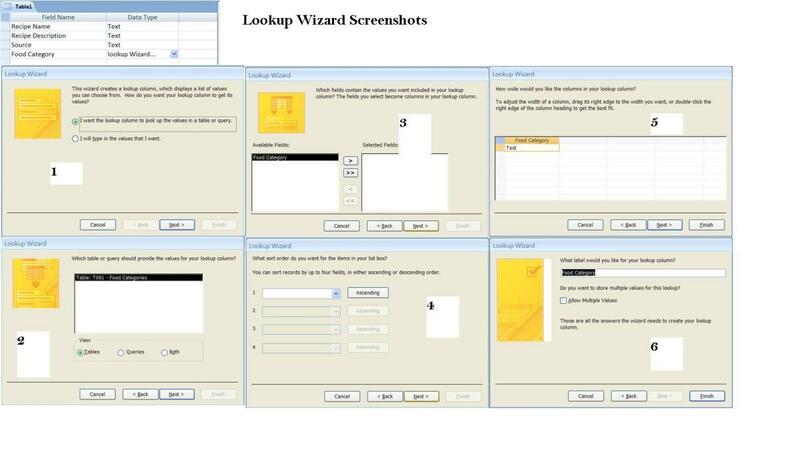 We will create a report template and then use copy/paste to create two more with a few tweaks. Report writing is a lot like form design. It will take some time to organize everything the right way. The first report that we will create will be a report that lists all recipes by name. On Access’ “Create” menu, click on the “Report Design” button. This will open a blank report. 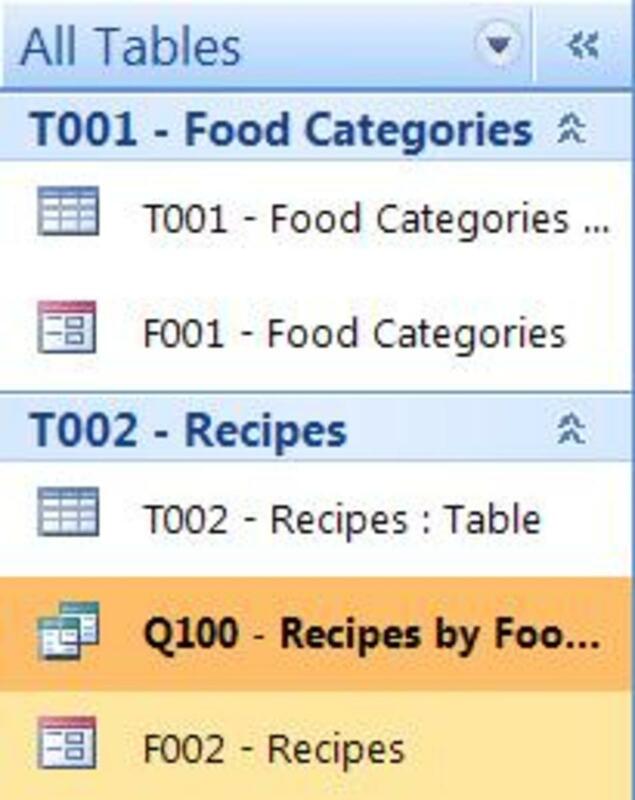 Save the report as “R002 – Recipes Grouped by Food Category”. 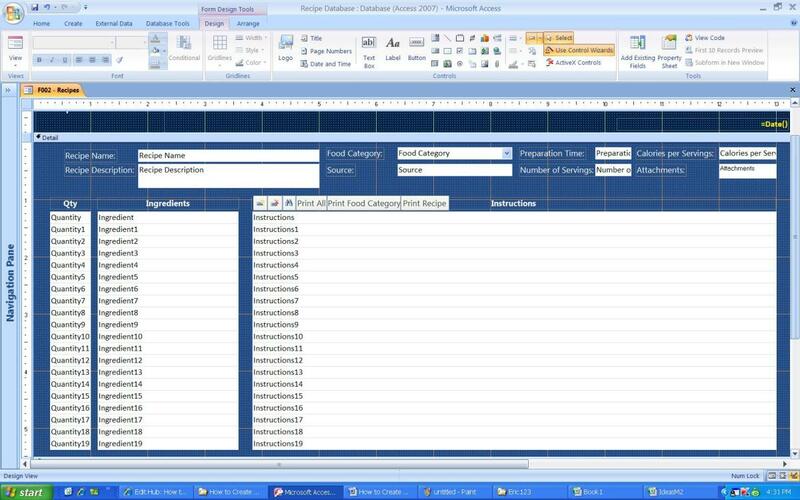 Click on the “Add Existing Fields” button and then open up the fields for table “T002 – Recipes”. Drag “Recipe Name” into the detail section of the report. Now click on “Recipe Description”, hold shift down, and click on “Instructions19” at the bottom and drag all of those fields into the detail section. The biggest thing to remember is that you want to make sure each recipe prints on only one page. Right-click on the “R002 – Recipes Grouped by Food Category” and copy it. Now right-click in the same area, paste the report as “R003 – Recipe Category”, and hit enter. Right-click on the new report and open it in design view. Click on the “Property Sheet” button on the far right side of the “Design” menu. Change the “Record Source” to “Q100 – Recipes by Food Category” and save the report. 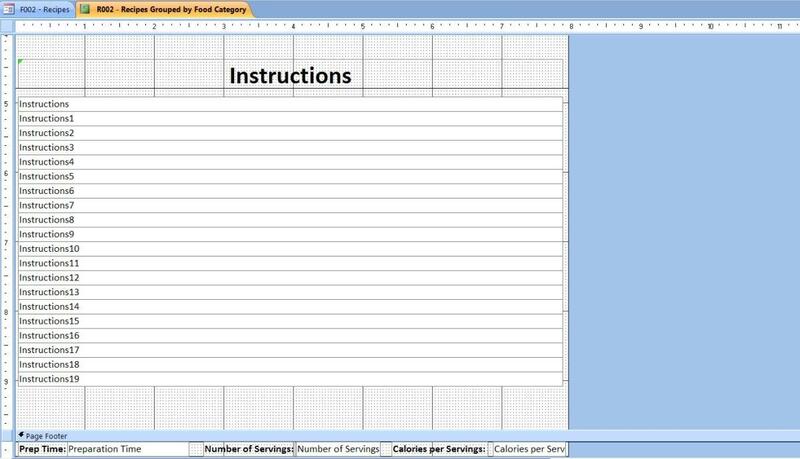 Repeat the first step in the last section, except paste the file as “R004 – Create a Recipe Card”. 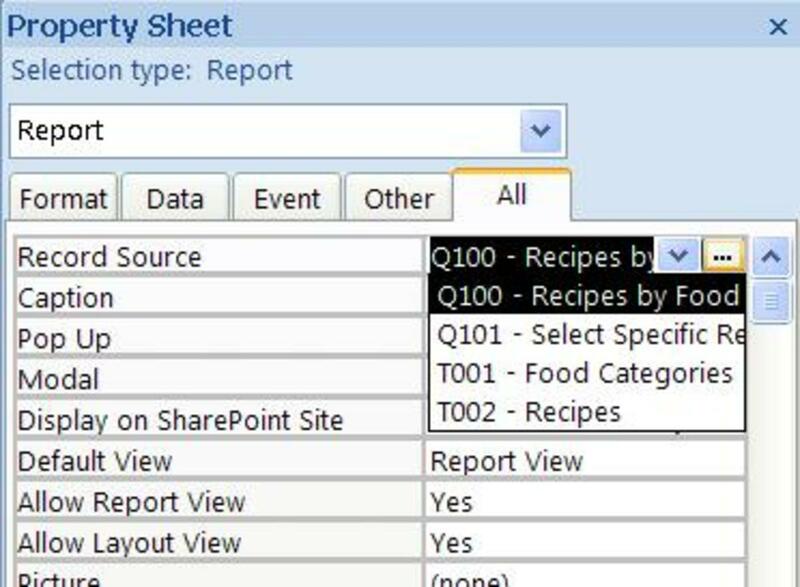 Repeat step two above, but change the “Record Source” to “Q101 – Select Specific Recipe” and save the report. To finish this recipe database off, open the recipe form (F002 – Recipes) into design view. Now we will add a few buttons that will automate this database. Arrange them however you wish. New Record Button – On the design menu, click on the “Button” button and draw it out in the form header section. A popup box will appear. 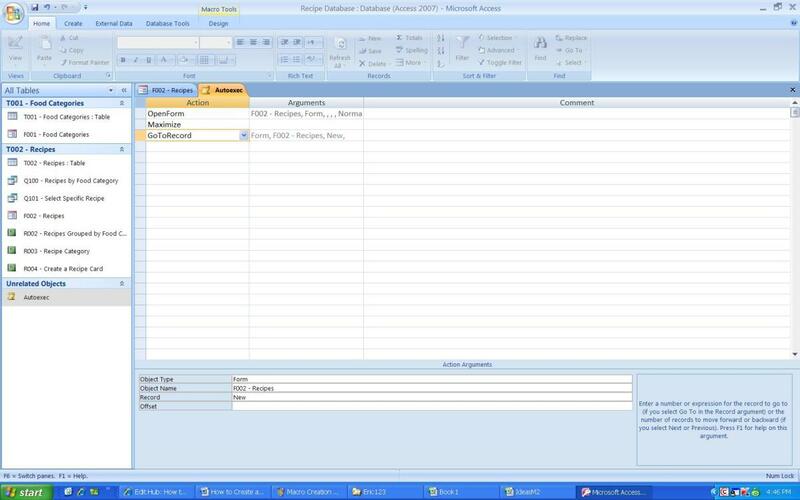 Select “Record Operations” as a category and “Add a New Record” as an action. Click finish. Resize the button to a small square. Delete Record Button – Same as the instructions above, except select “Delete Record” as the action instead. Find Button – Start out the same way, but select “Record Navigation” as the category, and “Find Record” as the action. Click Finish. Print All Button – Click on the “Button” button and select “Report Operations” as the category. You can either chose “preview the report” or “print report” as the action and click next. Select R002 as your report and click next. Click on text and type “Print All” and then click on the finish button. Print Category Button – Same as above, except select R003 as your report instead. Name the button “Print Food Category”. Print Individual Recipe Button – Same as above, except select R004 as your report instead. Name the button “Print Recipe”. Define Categories Button – After drawing out the button, select “Form Operations” as your category, and “Open Form” as your action. Select “F001 – Food Categories” as the form and click next twice. Change the text to be “Define Food Categories” and click finish. Your recipe database is ready for use. Enter all of your favorite recipe cards into it. Remember that Access is fully customizable and that you can makes changes later. As a word of caution, be sure that if you add or delete any fields that you update all of the items down the line (queries, forms, reports, etc). Have you ever used Access before? Thanks for this! I have used Access before but not much. The steps were easy to follow even though I am in 2016 so they weren't quite exactly the same. Thank you for this tutorial. Considering I have never used Access, this was a good one to start with. I am currently trying to build a database for work (assisted living facility) due to their tedious and ineffective manner they use keep up with their inventory, standardizing recipes so that everyone is on the same page, as well as digitizing their ordering process and having "real" reports on waste. If anyone has an idea where I can go from here to do that, I would deeply appreciate it. Thank you very much for this article. I found this very useful for my database class. 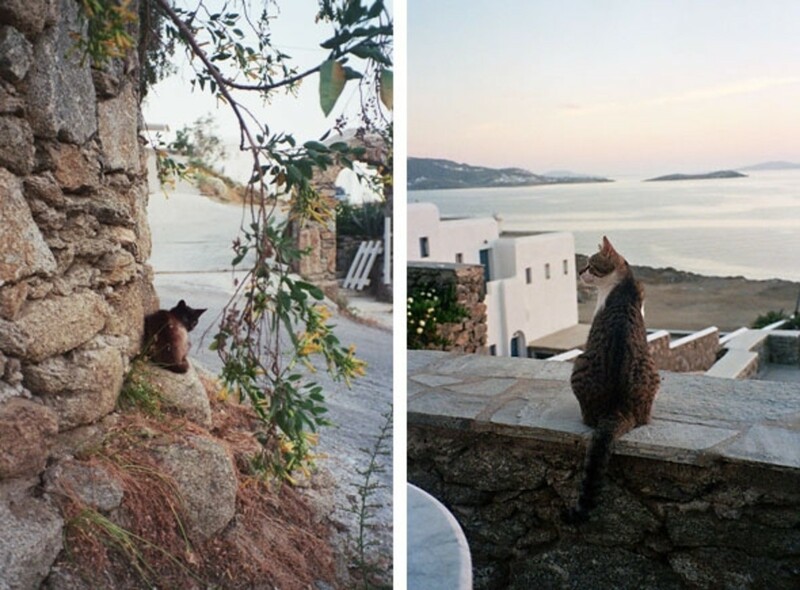 Have a good weekend friend. I followed steps under recipe table and when I selected the Lookup wizard for the food categories I got an error message that No valid fields in T001 - Food Categories table. This was really nice of you to share. Great job! Great info! I've built recipe databases for websites in MySql and PHP before, but this is really handy for personal use, especially if you love cooking! Clever idea, Eric. 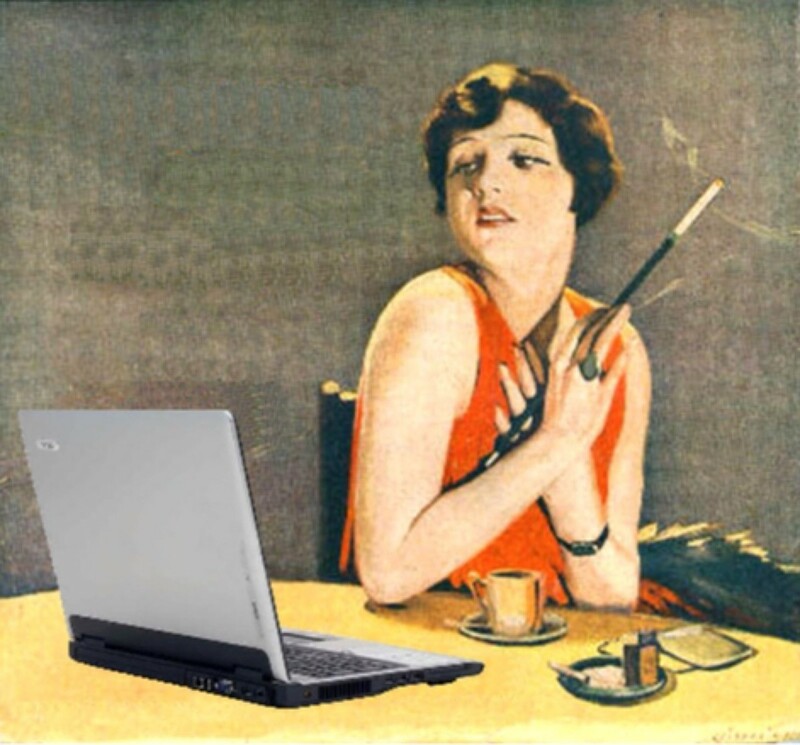 You can post your own recipes or ones from the Internet or other sources. Who would need cookbooks anymore? Voted up. Getting started in Access is pretty easy. Creating tables to house data is straightforward and simple. 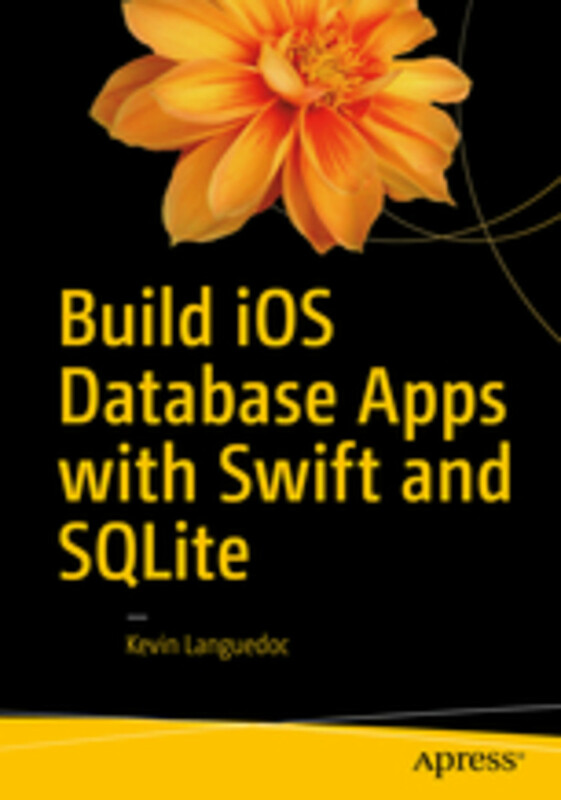 Queries are probably the most challenging part depending on what you are trying to do. I have never used Access before. This seems like a good idea. How hard would it be to get started with Access? I have had some programming experience in the past. Been a while since I used Access. 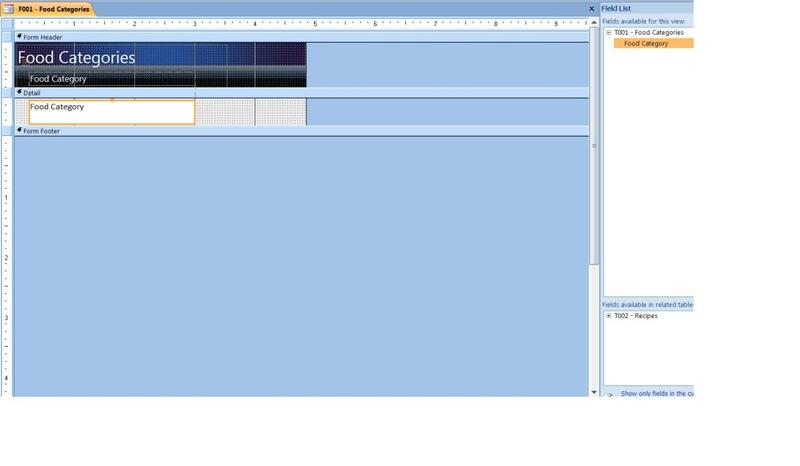 I'm going to give it a try - but I feel I will be making a "pdf organizer" instead of a full blown recipe index. I have used word to create a one-page notebook sheet for each recipe I have. My Database only needs to be a front end (ingredient, category, etc.) 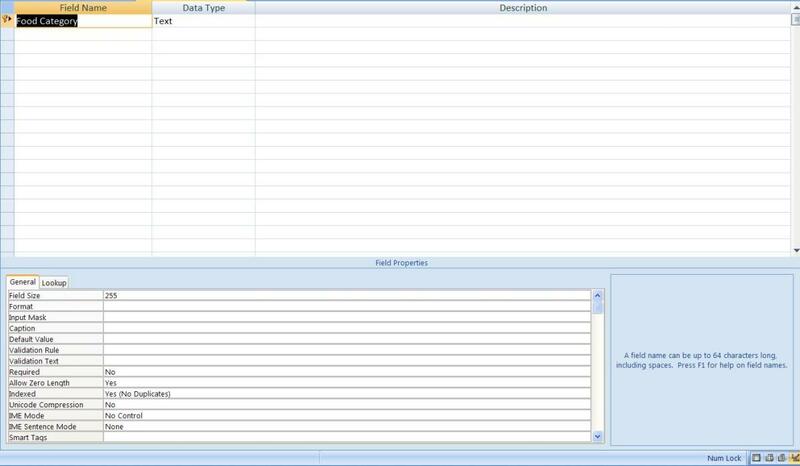 searchable organizer to bring up the specific pdf sheet for viewing and printing. Should be quite a snap with your instructions. Thanks for the tips. I like to keep a lot of my recipes in Google Drive so I can access them with the tablet in the kitchen. They can also be downloaded easily enough if I have to go somewhere. I'm very new to Access, but your tutorial was great! I was wondering how to set up a query to search by ingredient? Thank you so much this is great!! Access has amazing tools for those wanting to try it out, and it's not limited just to recipes. I've myself used the tools to effect in several places, and the results have always been impressive. 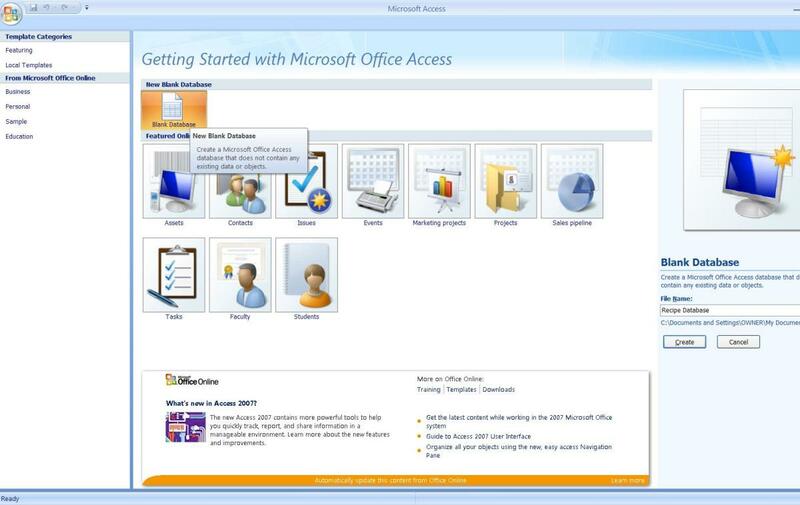 More MS Access, another hub for keeps. Thanks for all the guidance and tips! Thanks! Learning Access took a lot of trial and error before I figured much of it out.